The yard and garden is one of the first things visitors notice about any property. Add curb appeal and create privacy around your yard with Timber Garden Screens and Privacy Panels. By planting a garden, installing outdoor decorative screens and improving worn fencing, you boost curb appeal while filtering views. And curb appeal isn't just for private homes - a friendly, welcoming business attracts more customers and has higher earnings. We're here to help you make your exteriors as grand or subdued as you'd like. Paintable and modular for easy installation, anywhere. Hooks and Lattice's collection of timber decorative screens and privacy panels are all modular, meaning you can combine and/or cut as many panels as needed to create your design and fit your space. Cover an unsightly wall, fashion a privacy fence or - think more 3 dimensional, using panels to build outdoor bench seating and arbors. Screens with higher blockage percentage allow less visibility than screens or panels with lower blockage. Browse our designs below or call toll-free. 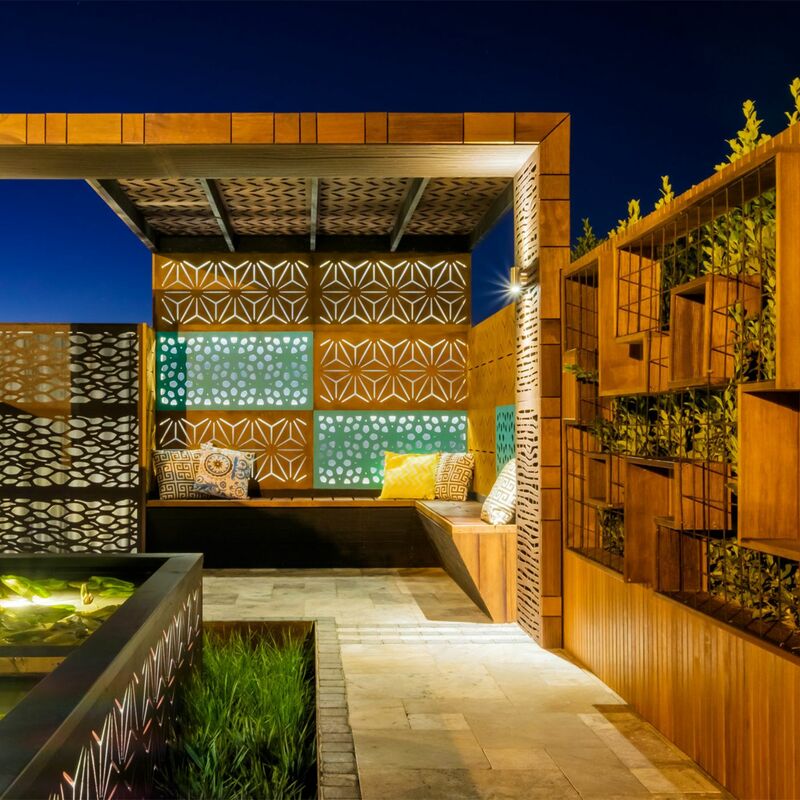 We all know plants and flowers are welcoming, but where do garden screens and outdoor privacy panels fit in? Well, if plants and flowers set the tone for a yard or outdoor space, then the screens are their dramatic backdrop. We have screens that will help you conjure up scenes from around the world, drawing in visitors while still maintaining your desired level of privacy. Choose the plants and flowers that appeal to you most, and then pick the panel design that fits your design theme. For example, if you are partial to geometric angles or bamboo, we have the Bricks and Lahaina screens that will help you create the look you are going for. Or if you prefer palm trees, reeds and other tropical elements, the leafy backdrop of Waimea, the fluffy, cloud-like look of Kumo or the floating leaf design of Arbol are excellent options when choosing decorative screens for your yard. Also available is a traditional, crisp Chevron pattern design that makes a wonderful backdrop for hanging baskets, while Star Anise looks like shooting stars on a straight trajectory. And if you like the blend of circles and straight lines, the unique look of our Orient garden screen will make your day. 60% Light Ambient (Minimal Privacy) - Ideal for portioning rooms and outdoor areas while allowing sunlight to filter through 40% of the panel. Also popular for use as suspended ceiling details or as 3D decorative wall panels. 80% Moderate Privacy - Play with light and shadow effects while adding a good amount of privacy. Complies with regulations for 80-20% privacy or sunlight blockout rule for new-builds or boundary structures. Also great for use as barrier partitioning. 90% High Privacy - Transform your space into an exclusive oasis just for you and your guests. Enjoy a more stylish alternative to timber slat screening that integrates seamlessly with LED back lighting. From start to finish, your backyard improvement project can be completed easily over a weekend. Whether it's a privacy thing, you need to fill a hole where a hedge has withered away, or you just want to refresh worn fences, you'll find exactly what you need in this collection of decorative garden screens. Panels can be fastened to any flat vertical surface and, while they don't require finishing, you are welcome to splash your favorite exterior low VOC water-based paint. For a rustic finish, leave untreated and allow wood to age naturally to a silvery-grey color. Backed by the manufacturer's 10-year warranty on material degradation, you can rest worry-free in your new, beautiful backyard.